Victory Christian School is a ministry of Victory Church. VCS seeks to develop lifelong learners through superior academics, a well-rounded curriculum and a focused emphasis on spiritual growth and Biblical training. Christian service ministries, AHSAA competitive sports, and a college preparatory High School are just some of the many opportunities VCS offers. Enroll your child today as we "Help parents train their children to be all that God has called them to be!" Victory Christian School (VCS) is a private Christian school that provides a quality education for students in pre-kindergarten through the 12th grade. VCS has been serving Christ in the St. Clair, Jefferson County, and Talladega community since 1984. Currently located in Pell City, Alabama just off Interstate 20 at exit 156, VCS is convenient for many families. We are SACS and AISA accredited. The mission of Victory Christian School is to help Christian parents train their children to be all that God has called them to be. Victory Christian School offers a quality education, a disciplined environment and a completely Biblical worldview in which Jesus is Lord. 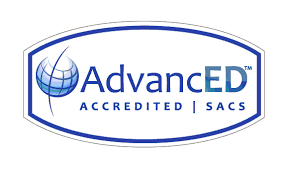 Victory Christian School is accredited by SACS / AdvancED and AISA. We also are a member of AHSAA, in the Class A division.